The No. 5/6Denver (11-5-1, 7-4-1 WCHA) Pioneers travel to #14 MSU-Mankato (8-5-3, 5-5-2 WCHA) for a two-game WCHA series on Dec. 12-13 in Mankato, Minn. Puck drop is set for 6:37 p.m. MT on Friday and 6:07 PM MT at Alltell Center- both games can be heard on AM 560 in Denver and www.DenverPioneers.com. DU owns a 14-13-4 advantage over MSUM in the series that dates back to 1997. DU is 5-9-2 including a 1-5-2 in its last eight games against the mavericks, including the memorable 8-7 ‘meltdown’ loss in 2003 when the Pioneers blew a 7-1 lead after losing a number of players to injuries. The last time DU swept the Mavs in Mankato was in 2001. MSUM was swept last week by SCSU in a home and home series, and will likely be agitated this weekend. The best player on the Mavs is defenseman Kurt Davis, who anchors the Mav blueline and leads all WCHA defensemen in scoring with 5-16-21, and works the Mavs power play (17.8%). Davis may be the most underrated player in the conference. Offensively, the Mavs have Mick Berge (18 points) and Mike Louwerse with 14, and a senior goalie in Mike Zacharias, whose 8-7-3 record, 2.76 GAA and .911 saves percentage is a considerable upgrade from what the Pios experienced last weekend at MTU. With more than 14,500 students including nearly 500 international students from 66 countries, MSUM is located on 300 acres overlooking the Minnesota River Valley some 85 miles south of the Twin Cities of Minneapolis/St. Paul, MSUM is the third largest higher educational institution in the state and is part of the Minnesota State Colleges and Universities system. The school was originally founded (like WCHA brothers SCSU and UMD) as a state teacher training school. Mankato Normal School, the first name of the university, was founded in 1868, and served 27 students when it opened. In 1921, the school became Mankato State Teachers College and began offering two- and three-year degrees. In 1939, the first four-year degrees were awarded; the first master's degrees were awarded in 1954. By 1956, enrollment exceeded 3,000. 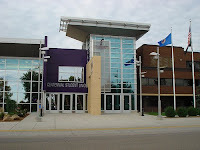 The school then became Mankato State College in 1957, with enrollment of 7,000; In 1975, the name changed again, when MSC became a full-fledged Mankato State University, as enrollment had grown to 14,000 students. In September of 1998, citing a goal of making MSU "the other great public University in Minnesota," then-president, Dr. Richard Rush announced that Mankato State University would become known as Minnesota State University, Mankato, the name it retains today. While some people still call the school Mankato or Mankato State, the proper name of the school is now Minnesota State University, Mankato. MSUM offers more than 150 programs in six undergraduate colleges, and 82 programs in the College of Graduate Studies. The school's most popular majors are: Business, Education, Health Professions, Computer and Information Science, and Criminal Justice/Corrections, with a majority of students hailing from Minnesota. Southern Minnesota does not have quite the depth of hockey culture that central and northern Minnesota does, so it’s no surprise that MSUM’s program is a relative newcomer in the grand scheme of Minnesota and WCHA hockey. While club hockey had been played on campus for years, varsity hockey did not arrive until the late 1960s, when a young coach named Don Brose (left) was able to elevate the club team to NCAA Division II status in 1969-70. Brose would become the one man synonymous with Maverick Hockey for the next 30 years as head coach, as he took the program from club level to the pinnacle of Division II, and then on to Division I, and ultimately, membership in the WCHA. Brose was able to build his program to Division II Championship status inside of 10 years. His 1977-78 team knocked on the door, becoming NCAA Division II runner up, and the next season, the program was determined to break the door down. The Mavericks went 30-9-1 in 1979-90, won the NCAA Division II National Championship, and Brose was AHCA Coach of the Year. He would go on to 11 NCAA tournament appearances, several more podium finishes, a .606 career winning percentage (536-335-79) and produced 31 Division II all-Americans in his Mankato career. Brose would go on to earn the respect of the entire coaching fraternity, as one of the gentlemen who taught more than the game to his charges. By the 1990s, the school administration had seen St. Cloud State, a fellow Minnesota State College member, elevate its program to the a viable WCHA member, and with a new 5,000 seat arena named for a local Wireless Company being built in downtown Mankato the opportunity for Division I status beckoned. The first MSUM team to be a Division I squad appeared in 1996-1997 as an independent, and went 17-14-3, a winning season right out of the game. After three seasons as a D-I independent, the 1999-2000 season saw the Mavericks join the WCHA in Brose’s 30th year as coach. He would proudly take the Mavericks into the WCHA as his swan song in coaching, retiring with a 21-14-4 record. In 2000-2001, Troy Jutting became coach of the Mavericks, and in only their fourth season in the WCHA, the Mavericks had their greatest season to date in 2002-2003. That year, the Mavericks were less by a dynamic duo of offensive stars, Shane Joseph and Grant Stevenson, who would go on to post 65 and 63 points respectively, leading the Mavs to a second place finish in the WCHA, and an incredible unbeaten stretch between December 13th and February 22 when the Mavs went 13-0-4. The great season resulted in an NCAA berth in the East Regional, where the Mavs fell to Cornell, 5-2, in the school’s only NCAA appearance to date. Since 1977, MSU athletic teams have been called the Mavericks. Prior to that, MSU teams were called the Indians beginning from 1935 -77, and before that the teams were known, variously, as the Peds (short for pedagogue "meaning school teacher or educator"), the Orangemen" and the "Purples." The 2008-09 season marks the 32nd year for MSU teams to be called the "Mavericks." The old name, "Indians," was dropped after a 10-year debate, for several reasons, the main objection coming from Native Americans. Another reason was that the school had switched conferences, joining the Northern Intercollegiate and it was felt that it was a good time for a fresh start. Douglas Moore, MSU's president at the time, asked University Relations Director John Hodowanic to begin working on changing the title and a group composed of interested students, faculty, and alumni brainstormed for a list of nearly 75 nicknames. The name "Mavericks," originally suggested by MSU Education Professor Roy Cook, was ultimately chosen over other popular tags such as "Muskies" and "Lightning." The first design of the nickname was a horse, but Moore maintained that the design too closely resembled the "Golden Mustang" used by Southwest State - another NIC school. Eventually Moore, a native of Texas, suggested it be changed to a steer. It may have had something to do with the many Maverick longhorn steer in the Lone Star state, but the idea stuck and was accepted. The MSU Athletics logo, itself, has gone through a transition of sorts, with the original design - the words "Mavericks" inside a line drawing of a bull, used from 1977 until 1995. The next logo featured a line drawing of a bull and was first used in the fall of 1995. The third generation design was incorporated in the spring of 2001 and a new rendering was unveiled in the fall of 2004. MSUM’s school colors were purple and gold, just as they are now. But in a homecoming game in 1936, MSU lost a coin toss to Winona (Minn.) State, who had the same colors. Our teams then wore orange and black or orange and dark blue until 1956 when purple and gold were officially reinstated as the official school colors. MSUM hockey crowds are perhaps known for playing the well known soccer song (Ole, Ole. Ole) after goals, and for fans sporting cowbells to compliment the Maverick steer visual mascot. Cedric Yarbrough - Actor, Reno 911! Mankato is a city of 32,000 located at the confluence of the Minnesota and Blue Earth Rivers in South Central Minnesota, and is the County Seat of Blue Earth County, with about total 85,000 people in the greater Mankato area. The city was first settled by Parsons King Johnson in 1852, and the city was founded in 1858, as a safe place for building and safe from river flooding. While one popular story exists that the Mankato name was a mistake, with a clerk supposedly misspelling “Mahkato” when he was looking at an explorer’s book naming the local Blue Earth River, the more likely origin is the local river was called Makato Osa Watapa by the local Dakota Indians. Mankato has a grisly place in American History, as it best known as the sight of the largest mass execution on US soil, when 38 Dakota Native American were hanged in 1862 for participation in an uprising against local citizens. President Abraham Lincoln, at odds with local populace, had pardoned 265 of the 303 people arrested at the behest of a local bishop, but the other 38 swung from nooses on what is now the site of the Blue Earth County Library. By 1870, the population had grown to 3,000, and 12,000 by 1920, 19,000 by 1950 and 32,000 by 2000. The largest local employer today is the Taylor Corporation (4,500), and the most famous Mankato resident is probably writer Sinclair Lewis. The city is probably best known as the home of the Minnesota Vikings Training Camp, where for the last 40 years, the Vikes have made MSUM their summer home, the second longest NFL camp residence behind Green Bay’s camp at St. Norbert’s College in DePere, Wis.
Mankato is also the home of the Happy Chef restaurant chain, including the original Happy Chef restaurant with a 40 foot statue, and was named “funniest city in America” by Hallmark Cards in 2004. While the Pioneers are flying along on a five game win streak and outscoring opponents 26-3 and Minnesota State was swept last weekend, the conventional wisdom would say that DU is in the drivers’ seat this weekend. 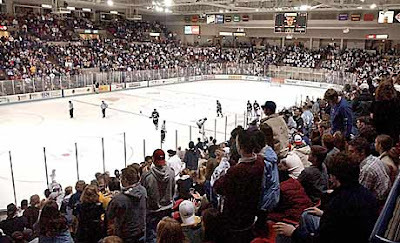 But anyone who knows DU’s recent adventures in Mankato, which include a 1-5-2 record the last eight games at Alltel Center against the Mavs, knows that strange things happen in this series, especially when these teams meet in Mankato. With DU missing their best defenseman this week (Patrick Wiercioch is in Ottawa, Ontario attending the Canadian Natonal Junior Team selection camp), the Pios will need to compensate his absence from the lineup. Given that DU has struggled when Wiercioch was last out of the lineup for an injury, it will be very hard for DU to replace Wiercioch’s transition-starting first pass, and his power-play skills. I think DU has the offensive and goaltending advantage this weekend, but I think the Mavs have the defensive edge, as Davis gives the Mavs the equivalent of what Wiercioch gives the Pioneers. DU will need to disrupt Davis, and keep him from feeding players like Berge. Playing at home also helps the Mavs, although DU might enjoy the larger ice surface. I'm not picking against DU in the middle of "The Streak." Census figures peg the number of people of African-American heritage in Mankato at right around 1200 or so.